I made these two small topiary Christmas trees for the powder-room. ... because I needed something that would be "powder-room-appropriate". (Yes, I still have these. No, I NEVER even think of throw them away. And because I use a lot of yarn that comes from a sort of a wholesale outlet, I have a lot of cardboard cones. The cone you can easily make using a piece of cardboard. But with my cones ready to go, my powder room Christmas edition was ready in few minutes. I cut a piece of white fabric, wrapped and glued around the cones, and had some "quality time" with my glue gun!!! 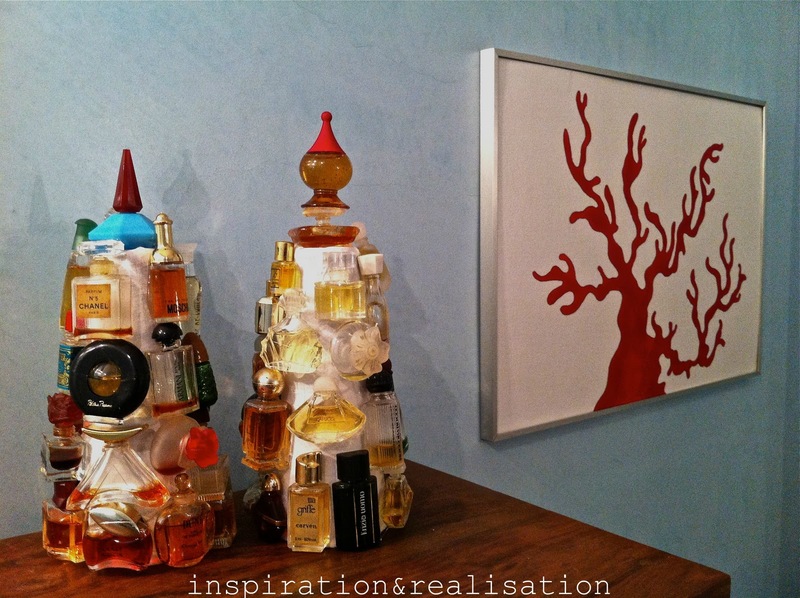 One blob of glue and one bottle after the next, my ornaments for the powder-room were ready in 5 minutes! and my sample perfume bottles in once! Have a wonderful and scented Christmas (and green, too) !!! Amazing. The trees are amazing. 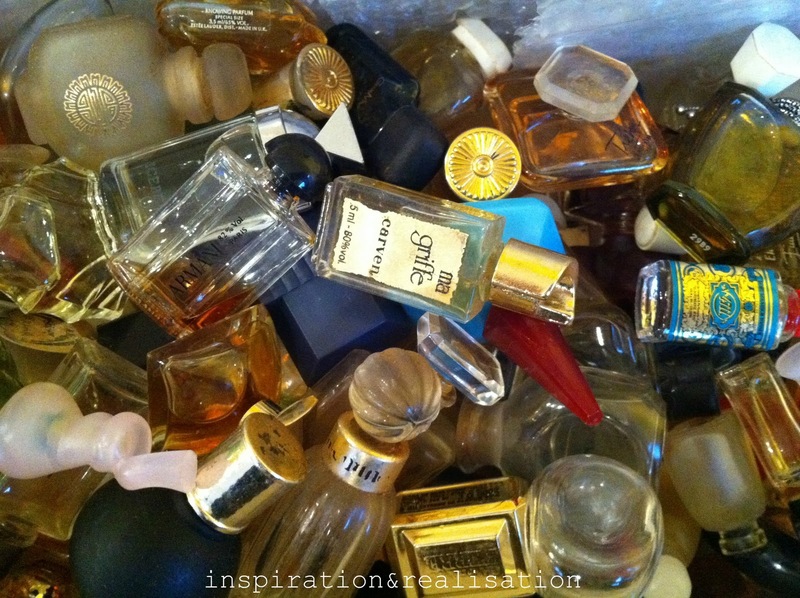 You have an endless amount of stuff and ideas. And you never cease to amaze! If you are decorating, I guess that means you are settling into your new home. What a great ide, they look fantastic! WOW!! I love these 'scented' trees! That's quiet a collection of samples you have! and I'm intrigued about this wholesale yarn place! that is hysterical and super smart. love it! Charming and I love that it is upcycled, Hugs! P.S> Have you added your lovely blog to my new blog list page? 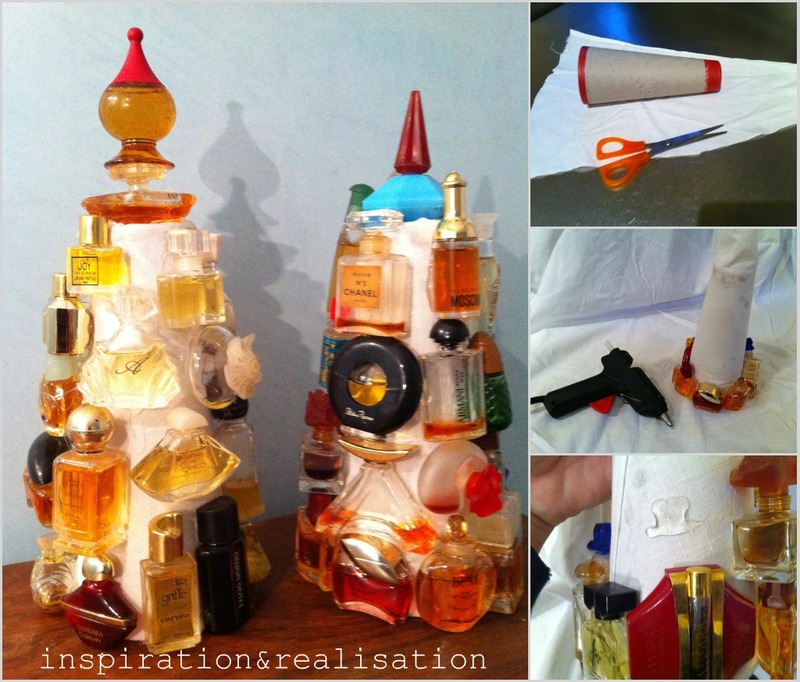 Now that is what I can do with all of my mini perfume bottles!